Dr. Lori Holland graduated from the University of Pennsylvania Veterinary School obtaining The Veterinariae Medicinae Doctoris (VMD) degree in 1987. After working in a full-service medical day practice and a specialty feline-only practice for a number of years, she found her niche in emergency and critical care medicine. Alliance Emergency was opened in July of 1994 and has been a cornerstone of care in Morris County ever since. Doctor Holland raised her 6 children, 3 canines and 4 felines while working nights, weekends and holidays for 24 years here at AEVC. "I believe that pet owners should be given all of the information available so that they have the tools needed to make an informed decision regarding their babies. That's the true marking of a medical team- mom, dad and the veterinarian." With the opening of our Wellness Center and the At-Home euthanasia services, Doctor Holland truly is able to offer care throughout every stage of your pet's life. Bill entered into the world of veterinary medicine in 2005 when living in Tucson, Arizona where he grew and then opened two animal specialty/emergency practices as Chief Operating Officer. Born and raised in northern New Jersey, Bill return to NJ in 2012 with his husband and four dogs. Here Bill became the Hospital Administrator for RBVH in Cherry Hill, followed by the opening of a 25,000 square foot facility in Mount Laurel NJ in 2016. Bill's love for animals has allowed him to develop a passion for the field of veterinary medicine and devote his career to owners and their beloved pets. Bill joined AEVC in 2018 as Chief Operating Officer. He strives to combine his professional experiences in accounting and business management with his love for animals in order to create a hospital environment where every client, pet, and staff member feels safe and confident in our practice. 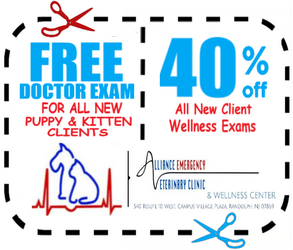 Alliance Emergency Veterinary Clinic's senior technician, Jose, has over 30 years of experience working with animals and in animal care. Starting as a handler at the Animal Medical Center in New York City, Jose worked beside studying Veterinarians for over 7 years. Jose then joined the New York University family as the senior caretaker of primates at NYU's Research Facility. After his time as a caretaker Jose trained as a technician at Animal Emergency and Referral Associates for 8 years. Jose then worked at Valley Central Veterinary Referral and Emergency Center for 5 years, and then at Gotham Veterinary Hospital for 2 years. After honing his skills in critical and emergency animal care, Jose has since worked for Alliance Emergency Veterinary Clinic. Two years later, you can find Jose at AEVC during emergency hours ready for any patient that comes his way. Approaching his one year anniversary here at Alliance Emergency Veterinary Clinic, Max is AEVC's wellness clinic's Veterinary Assistant. Although Max is a New Jersey native he was partially raised in Ohio where he ignited his career in animal care at Claremont Veterinary Clinic. After returning to New Jersey, Max continued to care for animals working at Eleventh Hour Rescue and the Wooster Humane Society. Max then attended the County College of Morris where he obtained a Certificate for Veterinary Assisting through the state of New Jersey. Once Max finalizes his experience working side by side with Dr. Burke here at AEVC, he aspires to become an Exotic Animal Veterinarian and stay local with his cat, Hammie! Approaching his one year anniversary with Alliance Emergency Veterinary Clinic, veterinary assistant, Jesus, has always had a passion for animals. A native of Puerto Rico, Jesus grew up in New York with his two pitbulls. After Jesus' sister-in-law introduced him to Dr. Holland, Jesus decided to pursue a career in emergency animal care. Jesus has been educated and trained under the supervision of Doctor Holland herself. Jesus plans to continue his work here at AEVC and aspires to become a certified Veterinary Technician in the near future. Veterinary assistant and youngest daughter to Doctor Holland, Micah has spent her whole life surrounded by the animals under her mother's care here at AEVC. Growing up, Micah raised birds, reptiles, rodents, dogs, and cats as she has a natural passion for animals and their well-being. From the ripe age of 8 Micah started witnessing and helping where she could with small tasks at AEVC. At the age of 14 Micah began her training as a Veterinary Assistant working side by side with Dr. Holland herself. On her spare time Micah enjoys doing odd jobs like pet sitting and fundraising for animal shelters by making and selling jewelry. Micah aspires to attend Veterinary School in the fall of 2020, following right in her mother's footsteps. Born and raised in Texas, Brenda is a first timer to the New Jersey area. Growing up with dogs, Brenda always had a passion for animals, and now lives locally with her husband and 3 canine children. Brenda has obtained a Bachelor's of Science in Health Administration from the University of Phoenix, concentrating her studies in Health Management. In her past, Brenda has worked as a nursing assistant and has over 8 years of experience working in customer service. Brenda's education combined with her skills and passion will make any client's experience here at AEVC easy and informed. Born and raised in Hunterdon County, New Jersey, technician Tegan grew up on a farm surrounded by animals. Starting as a young girl, Tegan bred and showed Quarter and Paint horses well into her early adulthood. Veterinary assistant and youngest daughter to Doctor Holland, Micah has spent her whole life surrounded by the animals under her mother's care here at AEVC. Growing up, Micah raised birds, reptiles, rodents, dogs, and cats as she has a natural passion for animals and their well-being. From the ripe age of 8, Micah started witnessing and helping where she could with small tasks at AEVC.